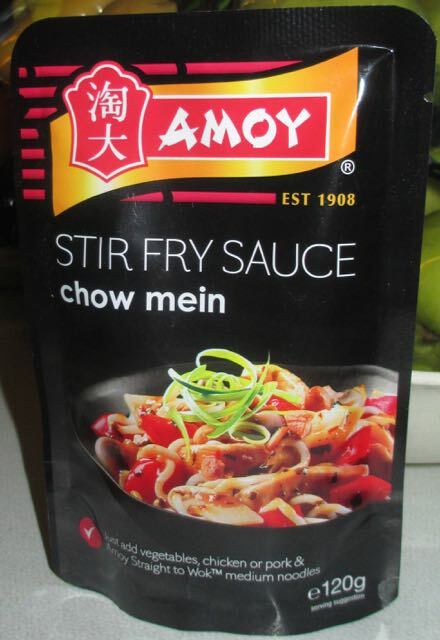 Im a big fan of quick and easy food, so when Amoy asked if we wanted to try out some of their sauces I couldn't resist. They sent some of their instant noodles too so it was time to get creating. 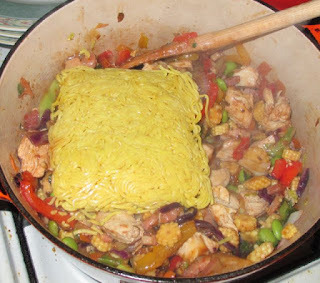 We decided to go for the Chow Mein to start with, and picked up some diced chicken, bacon lardons and a bag of stir fry veggies. 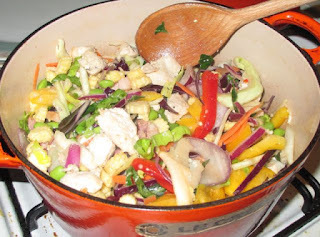 Whats more we thought we'd make it as a quick but tasty dinner on a work night. We had a recipe to follow, but altered it slightly for our own tastes. We added the chocken as an extra as I like the idea of mixing chicken and bacon, but I think it would work well with a number of meats, or indeed prawns. We started off by frying the chicken and bacon lardons is a dash of oil until cooked. 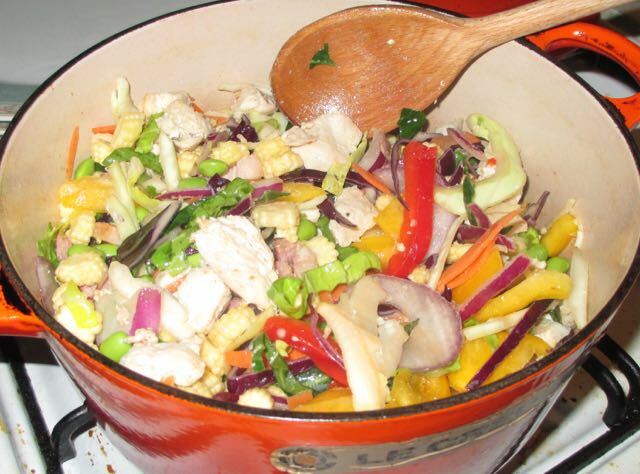 We added some onions, followed by a tables spoon of dark soy sauce and the rest of the veggies. We added the Chow Mein sauce next, which smelt wonderful especially when combined with the aroma from the bacon and onions. The noodles went in next, they started off as a block and soon broken down into fine noodles. 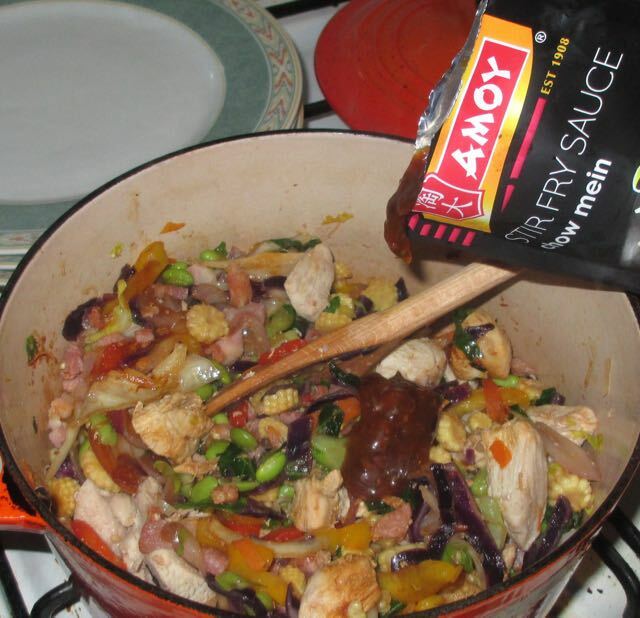 The final touch was another tablespoon of soya sauce just to add a little saltiness to the final flavour. The meal was very quick to prepare, even after a full day at work. 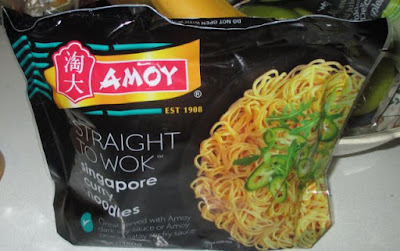 I loved adding the noodles straight to the pan, so simple. The flavours were outstanding, far surpassing any ready meal or take-way. 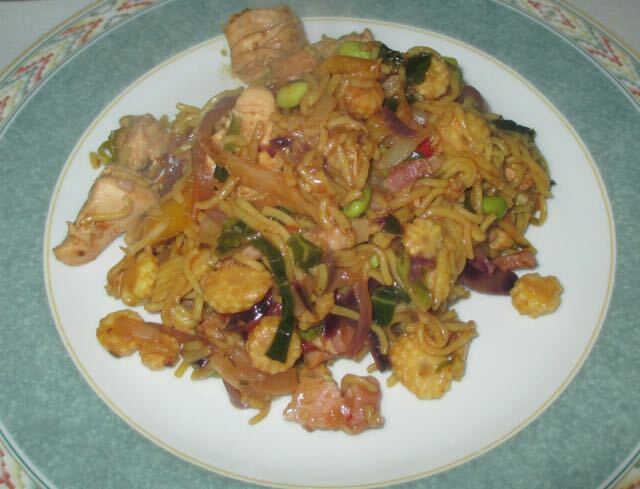 The Chow Mein sauce was the good balance of flavours, the soya sauce and ingredients balanced it off so very well, it was the perfect savoury flavour. It was meaty, tasty, slightly salty but fresh and moreish. We all cleared our plates and cant wait to try some of the other goodies we were sent.